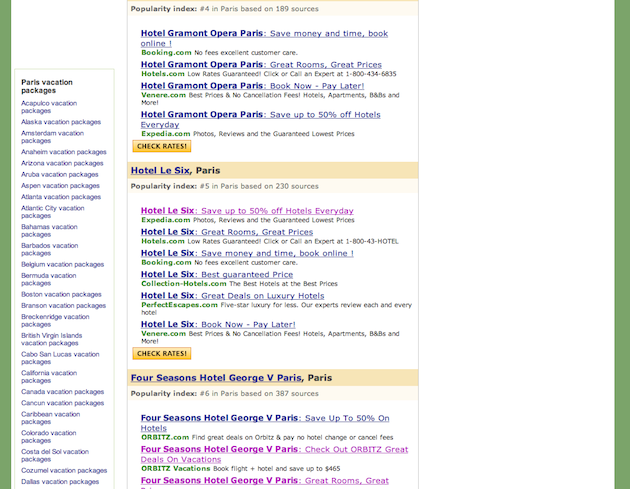 So, LeWeb ’10 is coming up. 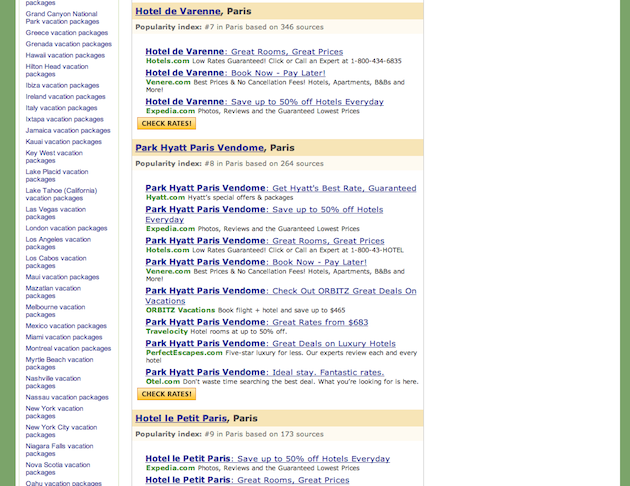 Let’s say you’re looking for some good ideas of where to stay and what to do in Paris while you’re there. Where are you most likely to turn on the web? Google. 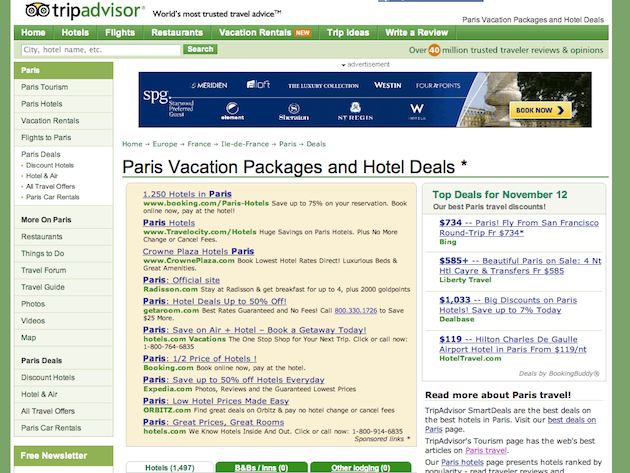 A search for “paris vacation” yields TripAdvisor as the top result. You click on that link. You’re greeted at the top by a banner ad. Below that, you get 10 sponsored links. To the right of that, affiliate links. Below that, hundreds more affiliate links. 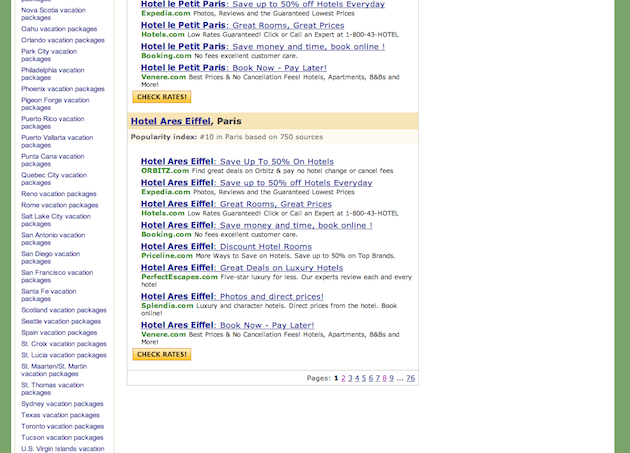 And more banner ads. There is not a single piece of actual content on this page. It’s one giant ad. And there are 76 pages of this. This is basically the state of trying to do research online for travel. It’s one giant SEO play which drives the winner a ton of traffic that they then monetize the hell out of with ads and affiliate links. It’s more or less then worst experience in the world for an end user. You’re doing research on a vacation, you want to see big, beautiful pictures of the place, some reviews, recommendations from people you trust. Instead you get hundreds of links that are bought and paid for. It almost seems like a joke. Google search results for hundreds of cities around the world are no better. Maybe this is exactly why we do need something like Blekko. Maybe we need humans, who can’t be gamed, helping with results. And if they are being gamed, we need transparency to see how and why and by whom. I don’t know. All I know is that this current system is really broken. 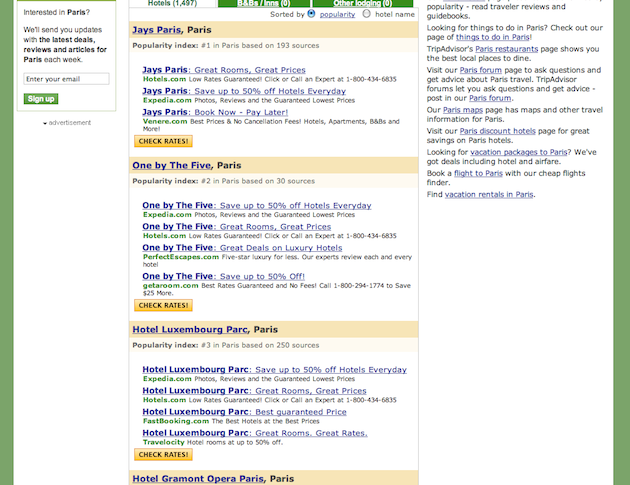 And shame on TripAdvisor for putting such garbage out there. It’s enough to make you want to go to a travel agent. Did you get this far? Impressive.